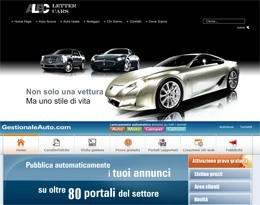 GestionaleAuto Integration :: International Portfolio :: PRO IT Service S.R.L. - Choose a professional and accessible service for your online image! LetterCars wanted to automate their car listing data entrance by importing cars data from their account from GestionaleAuto. Vincenzo Ammirati from Letter Cars hired me to integrate his car listing website with GestionaleAuto, an online service where he adds cars listing which then appear on many car selling resources. My client's goal here was to be able to operate his LetterCars.it business website automatically, without the need to have a human been go there and provide car details manually, as it was the case so far. This time, the client wanted to make sure that once a car is recorded by his staff on GestionaleAuto, that car would be submitted to all the car selling portals supported by GestionaleAuto, but also to his LetterCars website. I must confess that I've enjoyed a lot this idea my customer had with this automated process. This project reminded me about a similar job that I've worked on almost 5 years ago. In November 2006 I've been hired by BizReport to produce a movable type plugin which to import white papers and magazines from their account @ TradePub inside their movable type website. What made is quite juicy, was the fact that the xml feed containing the data from GestionaleAuto was full of details and thus, before starting the actual work I've had to compare all those fields with the ones already coded inside the LetterCars movable type project. After checking the custom fields from both places, I've had to update the ones from movable type and make sure that they are in sync, especially the drop-down menus. Then I've presented an inventory with the custom fields that are on GestionaleAuto, but not on his movable type website, so that he could decide which ones we should replicate on movable type, and which ones we would ignore. My goal here was to make sure that all the custom fields from movable type have a correspondent under GestionaleAuto, and that we are gathering enough details for the car listing to be effective. At that point, I've had to start what I enjoy the most, the programming phase. It took me a while to program the facility, but looking how nice it works, I must confess that I'm very happy with the result we've got. My work reads the data feed and if there are new cars, it records them inside movable type. While my explanation here is simplistic, so that any non-technical person could follow me, the actual workflow is quite complicated and follows a specific sequence meant to make sure that no duplicated cars would be created. Among the technical details, you may like to know that all the car images are downloaded from gestionaleauto and stored inside LetterCars website, and then when they are imported inside movable type they are associated to the car listing as movable type assets. The work is provided as a combination of technologies. In one hand a php script which handles the gestionaleauto feed and on the other a perl script packed as a movable type plugin, which handles the data import inside movable type. The solution I've coded is checking the data from gestionaleauto twice a day, once around lunch time and again around midnight and it imports any new cars it finds out. We've adopted this scheduling method, based on GestionaleAuto technical staff which suggested us to run the data import process once every few hours, not too often to not put too much pressure on their system uselessly. Since in between the time I've developed the site and this new assignment a few movable type releases have been launched, I took care to upgrade movable type to the latest version. The reason I did this, is that since the movable type installation that was in place, Six Apart launched a few more releases containing in one hand improved functions, and on the other a few security issues fixed. You could see the project live online, but let me show you two screenshots right away. Contracting from Letter SRL, Milano, Italia, U.E.